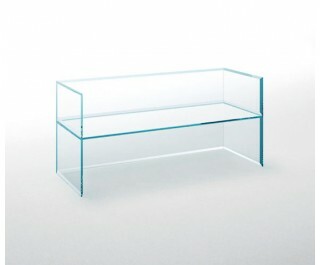 Bench, small armchair and sofa in transparent extralight thick, tempered and thermowelded glass (bench in 15 mm, small armchair and sofa in 19 mm). The glass is embellished with special bevelling which reflects and refracts the light, lending the object a rare preciousness. Despite its extreme lightness of form, the seat has considerable weight bearing capacity.